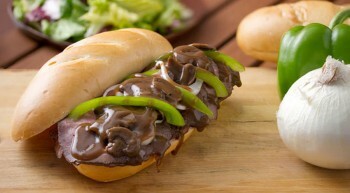 Vanee Mushroom Sauce is a rich brown gravy with a generous amount of sliced mushrooms, slowly cooked for an intense mushroom flavor. Great for meats, potatoes, and pastas. 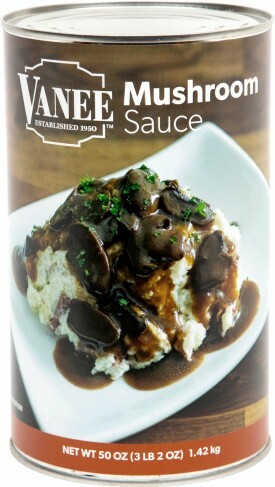 Vanee Mushroom Sauce has no added MSG, is shelf-stable for easy storage, and takes all of the guesswork, time, and labor out of preparing a mushroom sauce. Each 50 oz. can yields 23 quarter-cup servings, for 276 servings per case. Ladle over meats, potatoes, or pastas. Water, Mushrooms, Enriched Wheat Flour (Wheat Flour, Niacin, Reduced Iron, Thiamine Mononitrate, Riboflavin, and Folic Acid), Corn Oil, Salt, Food Starch - Modified, Sugar, Beef Flavor [Yeast Extract, Maltodextrin, Flavoring (contains Canola Oil), Beef Stock Powder, Lactic Acid, Calcium Lactate, Gum Arabic, Grill Flavor (Contains Sunflower Oil)], Caramel Color, Onion Powder.